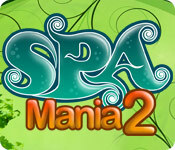 Spa Mania 2 is rated 3.5 out of 5 by 15. Rated 5 out of 5 by Shar18 from AWESOME!!! Loved the game it had me hooked. Wish there were more spa games just like this or even another one spa 3!! Rated 4 out of 5 by amylmenke from fun game I've played this numerous times and really enjoy it. It's a drag and drop type of game where the customer tells you where they want to go and you put them there and perform an activity. You can upgrade your stations and player to make it easier as well as get some assistants. I suggest trying it out. It's fun. Rated 4 out of 5 by rosekaufmann from WELL ANIMATED TM Very nicely-done and highly-polished TM game, much like its predecessor. 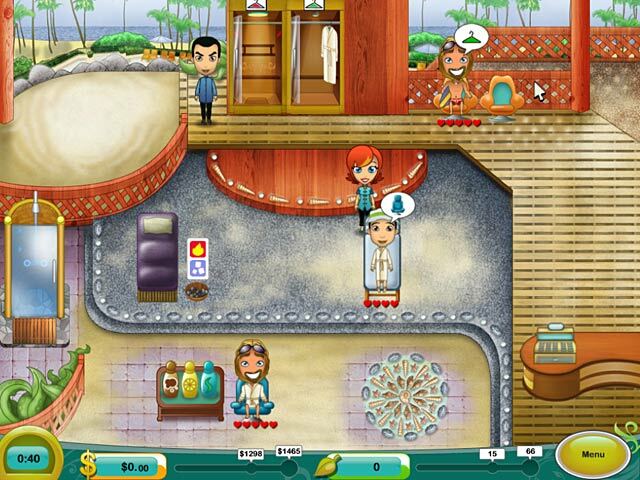 Visit 50 levels of Jade's problem-spas in various cities. 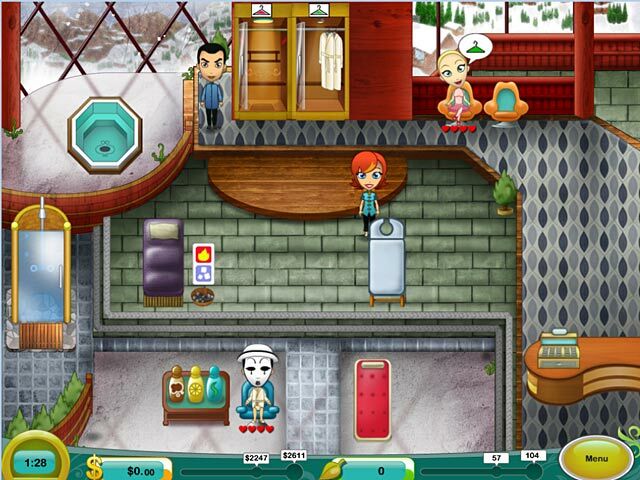 Meet funny characters, move them to the appropriate stations, minister to their preferences and cash them out. Use your money to purchase upgrades for Jade, her assistant, or the stations. Capture the customers who are deciding to steal money or product while Jade is busy at a station. Refill incense, tea and treatments in separate mini-games between levels. Good animation. Rated 4 out of 5 by hafizahazwir from fun games fun games favourit and I like verry much. Rated 4 out of 5 by Jperez from Fun time management game If you like time management games, this is a great game to play there are lots of levels to discover. 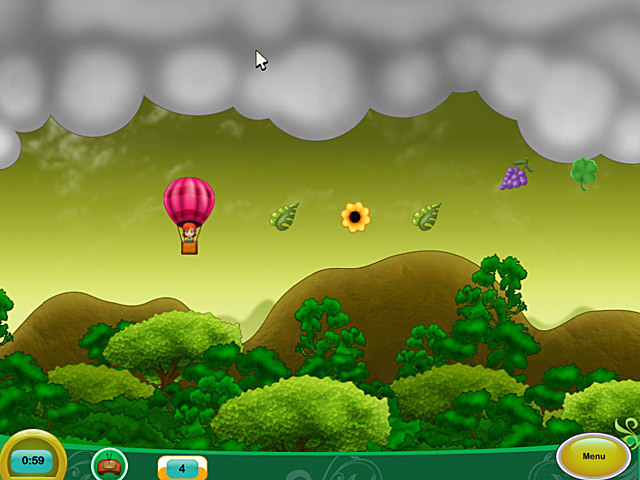 The mini games are fun to play and the graphics are good. I hope that you injoy this game as much as I did. Rated 4 out of 5 by Pucktweety from One vital flaw! This sequel suffers from the exact same vital flaw that the original suffers from (and as one other reviewer mentioned)!! I absolutely love the whole game play, and I do think the graphics are great but as part of your spa regime you can have a massage which requires several different 'muds' or something of the like and in both the original and this game there is an absolutely AWFUL mini-game to make those muds. The best thing about is that without those muds you don't do as well so you are forced to play the mini-game. There is also a really awful mini-game to gain incense too. If it wasn't for those unnecessary mini-games this game would be perfect. Rated 3 out of 5 by honeybee0042 from Fun game ... except for the minigames The minigames are just awful. There's no other way to say it. Fortunately, you can get through the game ok without doing too much of them. The minigames seem to rely far more on luck (as in getting the right things to run into). The special treatment minigame (using conveyor belts to move items around fans) was the least annoying, As for the game itself, I found it a great deal of fun, and enjoyed having clothing changes associated with power ups rather than merely cosmetic changes (as in the first game). Story line is rather 'meh' but not something that took away from game play. Rated 3 out of 5 by MsGayle111 from The Texas Level This game seems as fun as the first one, but the last phase of the Texas Level seems impossible to complete...there are just too many customers waiting too long and the amount of money you are required to get at the end of the day is too high. Help Jade travel across the country and make her Spas more efficient and eco-friendly in this exciting Time Management game!